The Commissioner of Delhi VAT vide Notification No. 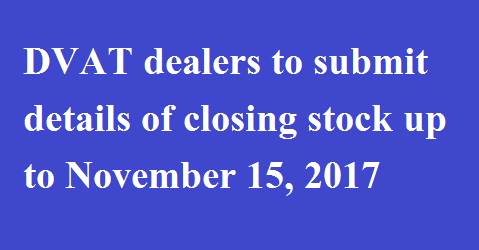 F.2(12)/Policy/2017/987-95 dated October 27, 2017 has required the previously registered dealers to submit online, the details of closing balance of stock as were held by them on March 31, 2017 and June 30, 2017. These details need to be submitted by not later than November 15,2017 in prescribed format at available on DVAT Website. IS THE VALUE INCLUDE VAT COMPONENT ALSO?